Door operating hardware, built-in locks and number plates shall be removed or thoroughly masked before painting. Surfaces that will not be painted are adequately masked and protected from overspray. All surfaces to be painted shall be sanded and washed with a proper agent to remove all dirt, grease and oil. “Feathering” will be done to assure a smoother job. All rusted surfaces will be sanded or wire brushed, thoroughly cleaned before painting. For an additional charge, lockers can either be spot primed or fully primed, as needed. After masking is completed, the specified surfaces shall be painted with a hard durable two-part polyamide epoxy or polyurethane paint (special order), applied electrostatically. The finish will have a minimum of three coats and will be textured unless otherwise specified. A smooth finish may require an extra charge. After allowing proper dry time, all masking and masking materials shall be removed. Handles, number tags and locks will be reinstalled. Clean-up will be thorough with any overspray removed. ElectroCoat’s objective is to provide our customers with the highest quality workmanship in the industry at competitive rates. We use the most advanced electrostatic equipment and finishes to turn your durable older lockers into lockers that look and perform like new ones. We advise our customers not to discard their investment made in older lockers (which were built with thicker gauges and metal latching mechanisms) for less durable new lockers which may use plastic mechanisms. 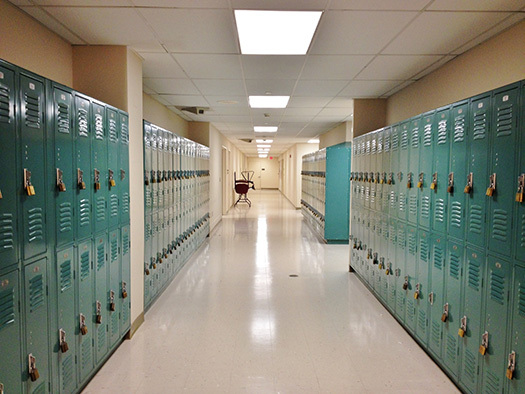 We assure that our process will provide you with a smooth transition to “like-new” lockers. ElectroCoat guarantees the finish against defects in workmanship for one year. Guarantee covers flaking, peeling and chipping, not due to normal wear and tear. All repair work will be done according to our specifications to satisfy the owner and will be checked and approved at the time of job completion. Replace or tighten nuts and bolts as needed. Straighten and re-bolt end panels, or you may wish to replace ends with heavy duty panels. See Optional Equipment Specifications. Bolt and tighten all door frame assemblies. Adjust all moving parts and lubricate. Repair or replace missing handles. Adjust, or if missing, replace hinges. Replace missing number plates as required, or install all new plates as requested. Align and refasten lockers onto bases. Adjust door frame latch and replace if needed. Repair latch bars and fingers and replace as needed. Adjust and straighten all existing and new doors to operate freely without binding. Heavy duty ends to be formed of 20 gauge mild steel. Ends shall be flat and fastened to door frames and side sheets with a minimum of 10 rivets or screws. The leading edge may be placed behind door frames when applicable and secured through existing holes or ends may be surface mounted on existing frames. Advantage: Looks neater, cleaner and reduces damageability. Tops to be fabricated of 22 gauge mild steel with closed ends. Pitch to be minimum of 25 degrees. Tops to be fastened to locker at no greater than 36″ intervals. Advantage: Prevents books, etc. from being stacked on top of lockers, causing damage and eliminates garbage. Overlay shall be fabricated from 20 gauge cold rolled steel. Slope top fronts shall be formed to insure a safe edge. Overlay panels shall be installed so that all joints fit tightly, rivets or screws shall be used to install overlay. All existing tops shall be straightened and refastened before new overlay panels are installed. Advantage: Reduces possibility of dents. Kick Plate shall be fabricated from 22 gauge cold rolled steel. Panels shall be installed so that all joints fit tightly. Steel rivets or self tapping screws shall be used to fasten panels to locker. Fasteners shall be spaced appropriately to ensure inseparability from the locker. Advantage: Keeps debris from going under lockers. Provides a more finished look and reduces trash under footed lockers. Bottom overlay shall be made from 18-20 gauge steel, pre-painted to protect against rust. Overlay shall be made to fit tightly into position. Advantage: Reduces dents caused by heavy books being dropped. Missing doors as specified shall be supplied as original or equal equipment. All efforts will be made to assure conformity by locating like doors in one group or area, swapping and rearranging existing doors as required. Built-in combination locks shall be provided for each opening. Each lock shall have three-number dialing, 5 combination changes and provision for master control key. Lock shall be deadbolt type, as provided by Master Lock #1670. Padlocks shall be Master combinations with key control. We do not repair Master locks.